Republic Day gift: 26 Pak Hindu migrants become Indians! There is celebration mood in Hindu migrant localities of Isanpur, Naroda/Sardarnagar and Sola road of Ahmedabad. 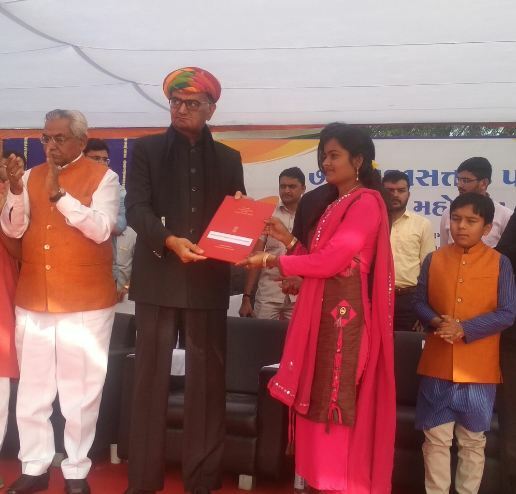 26 Hindu migrants got Indian citizenship certificates from MoS – Home, Law and Parliamentary Affairs Gujarat Pradipsinh Jadeja at 70th Republic Day function at Sangarva village Ahmedabad on Saturday 26th January. District Collectorate and Administration has organised the Flag Hoisting ceremony along with other colourful programs. 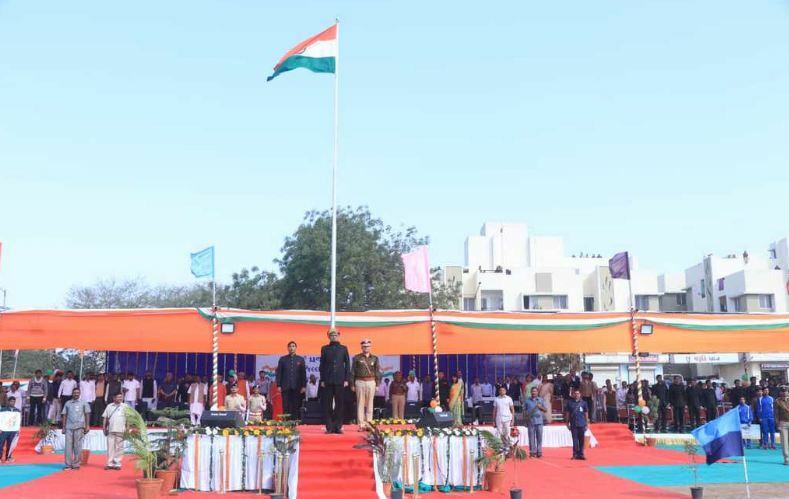 The Minister hoisted the National Flag at 9 a.m. and took the guard of honour from different wings of Gujarat Police. Minister Pradipsinh Jadeja along with DM and Collector Ahmedabad Dr. Vikrant Pandey inspected the platoons of Gujarat Police and appreciated their preparedness for security of the country. School children presented Desh Bhakti songs. Different Govt. departments presented tableaus showing different Govt. schemes. After that, the Minister distributed citizenship certificates to Hindu migrants. He inquired from migrants about their place of residence in Pakistan and prevailing conditions there. He welcomed Hindu migrants and told that now they have got all rights as the citizen of India. They should educate their children to make them a responsible citizen to contribute to family, society, and country. Forced to flee Pakistan in fear, these ex-Pak Hindus breathed freedom in India. The Pakistani nationals who had migrated to Ahmedabad years ago have received their certificate of Indian citizenship from the Minister. Every day since he moved to India, Darshna w/o Jeeteshkumar gives thanks for the peace that he and his family enjoy. The 38-year-old with her family moved to Isanpur in Ahmedabad from the Tharparkar district of Sindh province in 2006. “My husband ran a medical store/chemist shop in Pakistan. Unknown men would pelt stones at our shop. One day, a man stormed into our house with a rifle and threatened to kill us if we didn’t leave Pakistan. Today, we have our own business in India. Peace through spirituality is a basic and unique quality of India,” he said. Dr. Neelam Jagroo from Sindh province of Pakistan came to India in 2009. She along with her husband Rajesh and daughter will get citizenship after living here a decade. “I finished my MBBS in Pakistan and got married. But we never felt secure there. We longed to come to India where there was religious freedom. In Pakistan, we used to pray fearfully in temples. We would avoid the gaze of our neighbours while praying. In India, everyone is respectful of each other’s religion. I am happy that I have become an Indian today. Now I can go to meet my brother at London with blue colour Indian passport.,” said the 37-year- old Vastrapur resident who works in a city hospital. Her husband is a mechanical engineer by profession. Suman Khattar came from Rawalpindi to India with her parents in 2000. A gynecologist by profession, she is married to an Indian citizen. “I belong to a Hindu family and we faced a hard time living in Pakistan. When the Soviet- Afghan war broke out, there was strife in Pakistan, too. Two of our Hindu neighbours were shot dead. We were forced to hide our identities several times to save ourselves. In India, we have fundamental rights. Sindh Minority Migrants Association Secretary Rajesh Maheshwari and his team have been representing the migrants’ issues with Gujarat Home department and Ministry of Home Affairs Govt. of India New Delhi. Ministers, MPs, have recommended to Govt. of India for early resolution of problems. Last year in April 2017, Joint Parliamentary Committee on Citizenship under the chairmanship of Dr. Satya Pal Singh visited Ahmedabad. They held meetings with Hindu migrants in their localities Isanpur, Sardarnagar and got first-hand information. A Joint meeting of officials of MHA, MEA, Law Ministry, Gujarat Home department, FRO Ahmedabad, District Collectorate and representatives of Hindu migrants was held at circuit House Ahmedabad on 18th April, 2017 and discussed the issues. Joint Committee on The Citizenship (Amendment) Bill (JCCAB) has presented the report in the winter session of Parliament. SMMA thanked Prime Minister Narendra Modi for citizenship delegation power at the district level and extending the date for the further period till new order. Home Minister Rajnath Singh and MHA Foreigners division citizenship section also issued the notification at the earliest. Gujarat Government is taking special measures to steadily implement the Prime Minister s’ union cabinet decision. Chief Minister Vijay Rupani and Minister of State Home Pradipsinh Jadeja personally monitor the process of early grant of Indian Citizenship to Hindu migrants. With Gujarat Govt. Ministers advise Ahmedabad Collector and District Magistrate Dr. Vikrant Pandey is implementing the union cabinet decision of citizenship on war footing base. Under his leadership Collectorate team has issued more citizenship certificates than total citizenship certificates issued by all 15 districts of India (with delegative powers). There is no application pending at the DC office of one month and all are processed in time. Some old applicants are requested to submit required documents to complete the formalities on an early basis. Once again Hindu migrants, SMMA team are grateful to Respected Dr. Vikrant Pandey Collector and District Magistrate and his team for their extraordinary efforts for grant of citizenship to Hindu migrants. The following article has been submitted to www.currentriggers.com by Sindh Minority Migrant Association and only minor editing has been done for convenient reading. The views are of the groups’ own.